This is a sponsored conversation written by me on behalf of Horizon Organic. Who doesn’t love Taco Macaroni? With the kids helping make their own school lunches this year, here’s how we’re making our taco macaroni for school! Back to school time is one of my favorite times of the year. Maybe it’s because of the return to a routine after a lazy, crazy summer? Could be it’s the fresh haircuts on my kids, the fancy new duds my kids choose for their new school year? Or, maybe, it’s just because I geek out over dusting off our Operation Awesome School Lunch project! I just loooove sending them to school with a little lunchbox lovin’ a la mom. This year, we’ve partnered again with Horizon Organic and Kroger stores share how fun and fresh you can make your children’s school lunches in their natural foods section of their stores. Our nearest Kroger store is Harris Teeter – while it’s across town from where we live, I was eager to check it out because my friend Mary constantly brags how much she adores shopping there, and that’s a good enough recommendation for me! I am definitely willing to drive across town if they had a lot of the natural and organic foods we’ve come to love at great prices! I gotta admit, I was pretty impressed with what I saw – wide aisles, plenty of fresh produce, natural and organic foods, and lots of sales! We’re looking to take lunches up another notch this year for our family. We’ve been rocking the lunch boxes with Horizon Organic products for school lunches for years now. Not only good, but good for you, the Horizon Organic brand is a brand we believe in for our children and is easily found in Harris Teeter’s natural foods section. Our lunch boxes are excited (and mom is, too)! My kids have totally gotten involved with the lunch making process, now. My nine-year-old is my right-hand girl now, eager to move on from just “sandwich making,” wanting to cook on the stove like her older siblings. Simple things to make like macaroni and cheese are great dishes to start off with for pre-teens as they learn the do’s and don’ts in the kitchen. I chose to do an easy taco macaroni dish for her to make for the kids’ school lunches. You can even premake the taco meat in advance making this dish even easier to prepare with kids! Even if you prepare the taco meat with your child or preteen, they are simple and easy to add ingredients that your child can be proud to make. My kids raved over how great this taco macaroni tasted! My teen says he’s TOTALLY ready for the onslaught of harassment by his friends asking to switch lunches with him. Haha! Who doesn’t love Taco Macaroni? With the kids helping make their own school lunches this year, here’s how we’re making our taco macaroni for school lunches! 1 box Horizon Organic macaroni and cheese we used their "Classic Mac"
Brown ground turkey until cooked thorough and drain. Add taco seasoning as as instructed on the back of the taco seasoning packet. Add kernel corn and black beans to turkey when taco seasoning is added. Cook until corn and black beans are cooked through and excess water has cooked off the turkey. As per the packaging instructions, boil the macaroni in a pot of boiling water. Drain; add butter first and mix, then cheese package, mixing again, and then finally milk. Stir completely until cheese is blended well. Once mixed, top the prepared taco macaroni with shredded Horizon Organic cheddar cheese and your choice of taco fillings (optional). In addition to making taco macaroni for school lunch, we created two other easy to prepare school lunches that pre-teens can easily tackle on their own. You already know we’re a big fan of using dinner leftovers for school lunches, so using pizza from the dinner night before, you can cut them and make dippable “Pizza Sticks” for school lunch! Served with fresh produce and Horizon Organic chocolate milk, you can’t go wrong with a lunch like this! Also easy and delicious for a school lunch (especially for the littles) is taking lunchmeat and wrapping it up with Horizon Organic mozzarella cheese. These lunchmeat wrapped cheese sticks are a fun way for kids to eat protein for lunch that shies away from the typical sandwich. 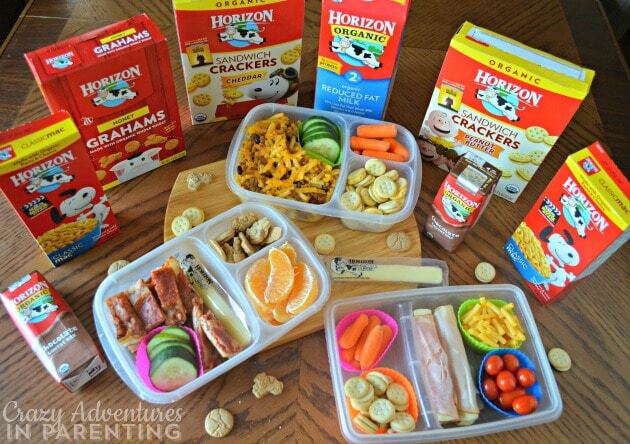 Serve it with some Horizon Organic macaroni and cheese with sandwich crackers and vegetables, you’ve got one healthy meal for your favorite school aged kiddo! Buying real food for your family should not be expensive or time consuming. Kroger brand stores make it easy for you to shop all the natural foods at your local grocery store so that you can find the foods your family needs simply and easily. Are you a Horizon Organic lover like we are? 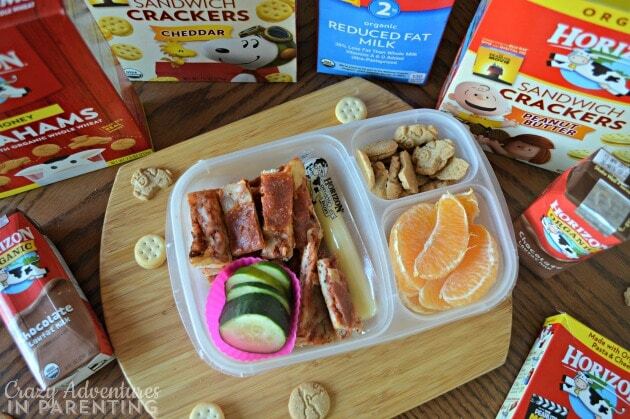 What are your kids’ favorite things to pack for school lunches?